Brushed steel stools are minimalist yet fashionable—they pair beautifully with all types of décor. They’re an especially nice match for kitchens with stainless steel appliances. 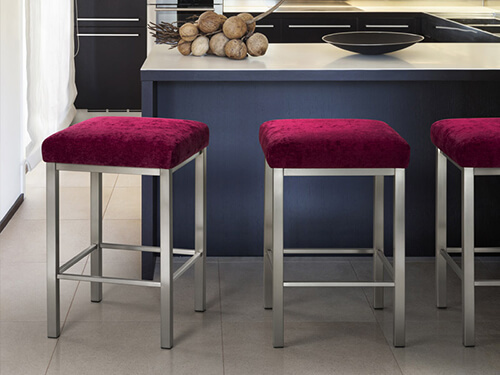 Read on to find out how brushed steel stools can add spectacular style to your kitchen. Brushed steel is made with a metal satin finish. The finish is made by polishing the surface of the metal, which creates a signature “brush scrubbed” look. It’s known for its pattern of fine lines and whorls that run parallel to the brushing direction. 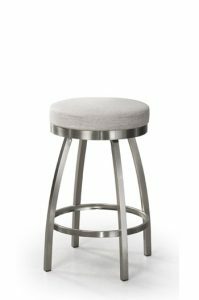 These stools come in more metals than steel—other commonly brushed metals include aluminum and nickel. Here at Barstool Comforts, most of our brushed stools are made of steel. Their welded metal frames stand up to tremendous amounts of weight and strain. They’re also easy to keep clean—they wipe off easily, hide fingerprints, and don’t chip or scratch. Last, their neutral metal finish keeps them fashionable no matter what color is trending. 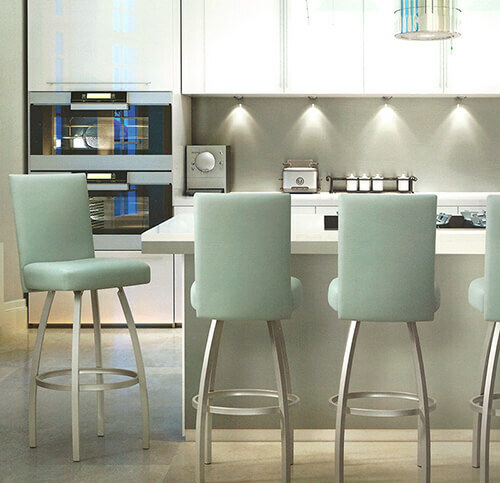 Brushed steel stools pair perfectly with modern kitchens. Their styles tend toward the abstract and subdued, though styles with both curves and angles are common. 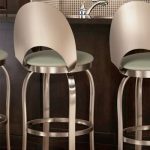 Best of all, these stools are a great match for modern stainless steel appliances. Refrigerators, sinks, dishwashers are all very common in brushed steel, and these stools fit right in beside them. They also pair well with brushed steel hardware. If you’re looking to add a touch of brushed steel to your kitchen, combine stools with new hardware and you’re done! 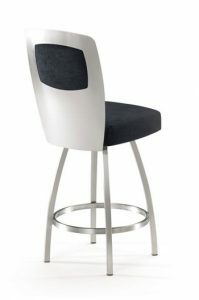 For examples of two of our favorite stools that work well in modern kitchens, check out the backless Henry and Calvin. Many kitchens have an industrial or restaurant look without being modern. 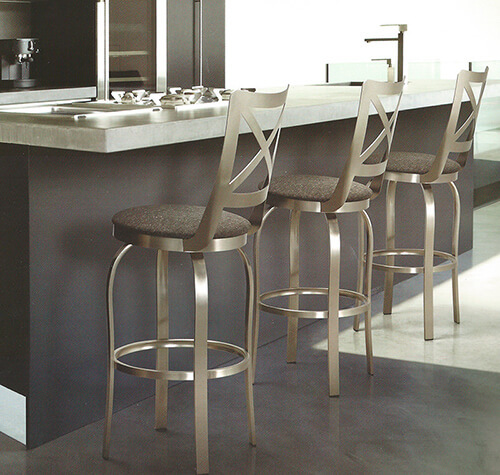 Brushed steel stools are a terrific choice here, too. They pair well with stainless steel islands and counter tops, ceiling-hung cookware racks, and industrial cabinets and carts. If you’re going for that Top Chef look, brushed steel works great. Brushed steel is right at home in retro kitchens, especially art deco and 1950’s aero-style. Think of the Chrysler Building and the Airstream trailer—the silver finish of these stools can add a 20th century zing to your throwback décor. 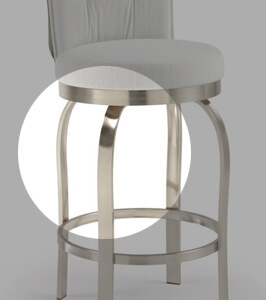 For an example of a stool that shines in retro kitchens, check out the Champagne swivel stool. Which is best for your kitchen? 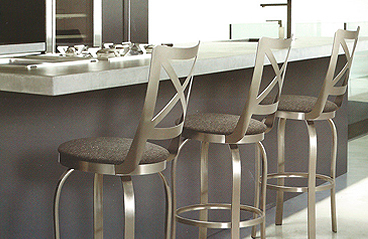 If you’re not exactly sure which brushed steel stool would be best in your kitchen, we’re happy to help! Just send us a photo of your kitchen and we’ll show you some options that would blend. If you’re trying to match a particular color, we can recommend stools with seat colors that will complement your shade. Email us or send a note here!